Believe it or not, it’s not too late for spring break camps — these businesses allow you to register for single days or partial weeks. Availability is limited! Jitterbug Performing Arts. Open for campers aged 3 (if potty trained) – 12 years old, with options for 9am – 1pm or 9am – 4pm camps. Jitterbug offers maximum flexibility and allows you to sign up for a single day, or all 5 days of camp. Throughout the day Jitterbug campers will sing, dance, play acting games, create props & scenery, and prepare for their spectacular performance! During the production hours at camp (1-4pm), Jitterbugs do a little “behind the scenes” work to create additional props, and scenery, learn about lighting & sound, costume design & other “techy” fun in addition to more stage time and imagination games! Vinings School of Art. For ages 5 – 14, divided into 3 age groups. Camp is from 9am – 3:30pm with optional early drop off and/or late pick up if arranged in advance. Camps are educational, creative and fun, and each day is different. Mable House Art Camp. For ages 6 – 12 and running from 9am – 3pm. Mixed media, drawing, painting, clay and more! Champion Kids. For ages 2.5 and older, camp runs from 9am – 1pm. You have the option of selecting the full week, or a shorter 3 day option. X-Drenaline Cobb Save $8 on an all access pass if you order online in advance. Use code “springbreak” to get your discount. X-drenaline is a trampoline park with foam pit, rock walls, dodgeball courts and even a ninja warrior course, all nearby in Marietta. Just Kiln Time. Click this link to get a 10% off coupon, good for Spring Break week! Just Kiln Time is a Marietta paint-your-own-pottery studio. There’s no “sitting fee”, you only pay for the item that you choose to paint. Chattahoochee Nature Center. The Chattahoochee Nature Center has a week full of fun events from camp to a fairy house scavenger hunt to story times. On Saturday there’s an intro to canoeing event for the whole family. SkyZone opens a few hours earlier than usual this week. You can start your jumping at noon instead of 3pm! South Cobb Aquatic Center has extended open swim hours this week: 10am – 2pm and 3pm – 7pm. Even if you’re not heading to the beach this week, you can still get your swimsuits on and have a blast. FARM (Farmer’s Atlanta Road Market) Opens for the season this Tuesday! It’s held at St. Benedict’s Episcopal Church on the corner of Atlanta Road and East/West Connector. 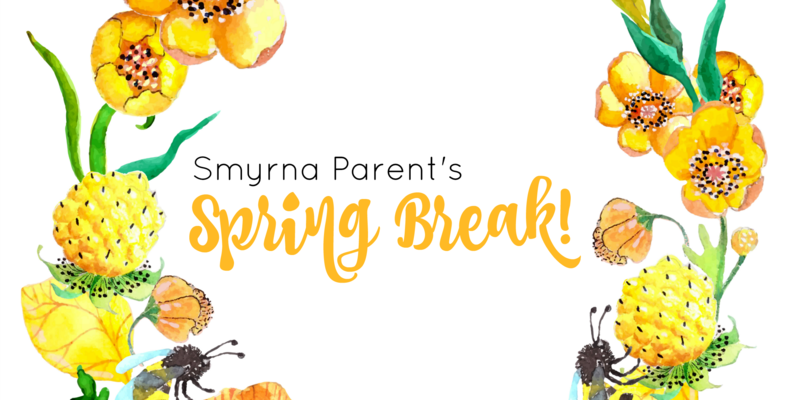 The Smyrna and Cobb County Libraries are maintaining their usual events schedule, so check out a storytime, craft hour or lego club this week. Several strawberry farms surprised us this year with a slightly-earlier-than-usual opening dates, so add strawberry picking to that Spring Break bucket list! Check out Smyrna’s list of parks (those with playgrounds are noted) and visit one you haven’t been to yet. We’ve visited about half of them and recapped them here. And here’s a list of trails in Smyrna. And here are Marietta’s trails.